EAST RUTHERFORD, N.J. (AP) Matt Ryan and the Atlanta Falcons are done with the AFC East. Good thing, too, considering how much they struggled against that division. 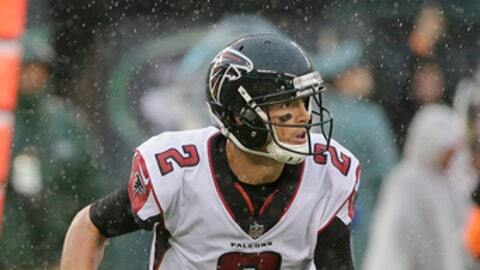 A 25-20 victory over the Jets in a driving rain Sunday snapped a three-game skid for the Falcons – all against New York’s division rivals. Next up for Atlanta is a more familiar opponent: the NFC South’s Carolina Panthers. Atlanta lost 23-17 to Buffalo on Oct. 1, 20-17 to Miami on Oct. 15 and then 23-7 at New England last week in a dense fog. At MetLife Stadium, the conditions were even worse, with the game played in a storm with drenching rain and strong winds throughout. ”That was some of the hardest conditions I played just for the length of the game,” quarterback Matt Ryan said. ”I have played in situations where we had some heavy rain or tough wind or anything like that for a little bit. From kickoff to the end of the game it was coming down pretty hard. Ryan fumbled four snap exchanges from center Alex Mack and lost two of them, and there were several dropped passes as the weather played a significant role. But Ryan and the Falcons (4-3) rallied in the second half, outscoring the Jets 12-3 in the final two quarters and slipping and sliding to a victory. ”Nobody flinched the entire game,” said Ryan, who threw touchdown passes to Austin Hooper and Mohamed Sanu. The Jets (3-5) had their own issues. Josh McCown had a bad snap exchange and fumbled on another play – but recovered. He finished 26 of 33 for 257 yards with touchdown passes to Robby Anderson and Eric Tomlinson. In a scheduling quirk, the Falcons are the only team in the NFL to not play a game against a division opponent. Six of their final nine games are against the NFC South, including their last four of the season. STILL STRUGGLING: The loss marked the third straight for the Jets, following a three-game winning streak. In each of the defeats, New York has started strong only to blow a fourth-quarter lead. ”I can’t really figure out what it is, why we’re not finishing,” defensive end Leonard Williams said. New York blew an early 14-0 lead against New England at home two weeks ago and then squandered a 28-14 fourth-quarter lead in a 31-28 loss to the Dolphins in Miami. The Jets have a quick turnaround with a game against division-rival Buffalo on Thursday night. NOT-SO-SPECIAL TEAMS: While Matt Bryant made all four of his field-goal tries for Atlanta, Chandler Catanzaro missed two of his four. Both misses – from 46 and 48 yards – led to touchdowns for the Falcons. The usually sure-handed Jeremy Kerley muffed a punt in the fourth quarter that led to Bryant’s final field goal. SILENT FALCON: Julio Jones was held mostly in check by Claiborne, who allowed the Falcons star receiver to catch just two passes for 21 yards. But Claiborne left in the third quarter with a foot injury, and Jones caught a 53-yard pass to set up a field goal. ”I’m just here to do my job for my brothers,” Jones said. SUPER BOWL HANGOVER? : With Atlanta mired in a three-game slump, some media and fans wondered if the Falcons’ season was about to spiral. Just eight months ago, they were in the Super Bowl. But there were doubts as to whether this year’s squad would be a playoff-caliber team. NOWHERE TO RUN: With the weather expected to be miserable, the Jets were aiming to run the ball a bunch. At least that’s what running back Matt Forte said. So, when New York finished with just 43 yards on the ground on 22 carries, Forte was a bit confused. It was a bit of a shot – and a surprising one by the usually reserved Forte – at offensive coordinator John Morton.